While authoring my forthcoming book, Maximizing School Librarian Leadership: Building Connections for Learning and Advocacy, I have read many professional books. This is part two of the eighth in a series of professional book reviews–possible titles for your summer reading. The reviews are in no particular order. But last week, twenty Cohort 2 Lilead Fellows, four Cohort 1 speakers and other supporters, the Lilead Project Team, and five mentors (of which I am one) spent four days thinking and talking about, writing and revising our “whys” in terms of the Fellows’ Lilead projects. Throughout this process of connecting the purpose and value of school librarianship to goals for their projects, Fellows had support for pushing their thinking and connecting their “whys” to their personal and professional values and to their school districts’ priorities. John noted that for many library supporters a librarian “who cares (about other people’s literacy needs and welfare) is a proxy” for supporters’ own desire/need to care. These people comprise the “library party” and believe that the library is a transformational force in their communities. Everyone in the room agreed that passionate librarians are “true advocates for lifelong learning.” These connections apply directly to the “whys” Lilead fellows are addressing with their projects. When the Fellows were asked to share the key ideas that frame their projects, the similarities in their “whys” were very exciting. This is what I heard in terms of key concepts: issues (access/budget/resources/staffing) related to equity (7), cultural responsiveness (2) a subset of equity, librarians as instructional/digital leaders/building capacity (5), advocacy/changing perceptions/increasing visibility (3), K-12 curriculum (2), and increasing future-ready learning spaces (1). To “see” the Fellows’ “whys” expressed in these ways leads me to believe that the school library profession can coalesce around a shared overarching “why.” With a collective “why,” the “what” we do and “how” we do it may look different in different schools and districts but the benefit of an overarching “values-based approach” (John Chrastka) can help school librarians work within a shared values framework. It can help us identify and build coalitions. It can help the Fellows elevate their projects because they are based on authentic truths—on the school library profession’s shared values. 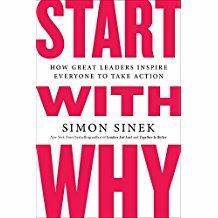 Thank you to Simon Sinek for giving us the “why” prompt as a stimulus to our thoughts, discussions, and the feedback we shared with and received from one another. Thank you to John Chrastka for teaching us about political literacy and helping us apply these principles to help us achieve our goals for and with our library stakeholders. We look forward to learning more with you. Thank you to Roger Rosen, president of Rosen Publishing, for joining us in Norfolk and for sponsoring our learning with John. We are grateful. Sinek, Simon. Start with Why: How Great Leaders Inspire Everyone to Take Action. New York: Penguin, 2009. Sweeney, Patrick PC, and John Chrastka. Winning Elections and Influencing Politicians for Library Funding. Chicago: ALA Editions, 2017. While authoring my forthcoming book, Maximizing School Librarian Leadership: Building Connections for Learning and Advocacy, I have read many professional books. This is the eighth in a series of professional book reviews–possible titles for your summer reading. The reviews are in no particular order. Although I had previously listened to his TEDTalks, I did not read Simon Sinek’s Start with Why: How Great Leaders Inspire Everyone to Take Action until it was assigned to the Lilead Project fellows. As a Lilead mentor, I am reading and learning along with the fellows. Beginning with the dedication, I have a deep appreciation for the message Simon Sinek communicates in this book (bold added). “There are leaders and there are those who lead. We follow those who lead not for them, but for ourselves. for those who want to find someone to inspire them” (np). Since the school library profession does not have one single charismatic leader with an immutable sense of “why” (backed up by a flexible menu of “whats” and “hows”), arriving at a single “why” is more challenging in our organization(s). I would like to believe our profession could come to a shared understanding – a shared “why” – a shared value that aligns with the values of other educators, administrators, and educational decision-makers and stakeholders. That “why” could speak to potential advocates and would encourage them to act on our behalf. One of the tensions I feel is that the “what” (description of what we do) and “how” we do it different (or as Sinek says “better”) from classroom teachers is not shared by all members of our profession. There are those who are still printed books and reading promotion only school librarians. There are those who are technology above all else school librarians. The “hybrids” are growing in number but expectations in various schools and districts may contribute to this polarization that muddies our identity and the perception of others regarding our “whats” and “hows.” From my perspective, our “why” has to be larger than the resources and tools we use. My “why” for school librarianship was born during my M.L.S. program and was crystallized during the heady days of the National Library Power Project in Tucson Unified School District (1993-97). For me, school librarians’ purpose is to colead with principals to ensure that their school communities are dynamic environments for nurturing continuous development and growth in order to improve teaching and learning. For me, school librarians’ instructional partnership role is the most direct, assured, and documentable path to leadership. It is “how” we achieve our “why.” School librarians lead when our commitment to improving our own and our colleagues’ instructional practices builds a culture of collaboration and continuous learning in our schools. “What” we do is develop expertise and mastery with our colleagues in order to improve student learning outcomes. Why do we do this? Because “teaching is too difficult to do alone!” (from a Library Power poster, circa 1994). With a global view of the learning community and a flexibly scheduled program based on access at the point of need, the resources of the library and the instructional expertise in their toolkits, school librarians occupy a unique niche on a school faculty. They must embody the behaviors of risk-takers and continuous learners. They must serve as models because they have the potential and responsibility to impact the learning of every member of their school learning communities—students, educators, administrators, families, and external stakeholders. They must help other reach their capacity. As Sinek writes: “It’s the decision to never veer from your cause, to hold yourself accountable to HOW you do things; that’s the hardest part” (65). In my experience, collaborating with adults is a thousand times harder than collaborating with students. If we want to hold each other accountable for forming effective instructional partnerships that build an effective teaching force and improve student learning, we have set the bar high. “A WHY is just a belief; HOWs are the actions we take to realize that belief; and WHATs are the results of those actions. When all three are in balance, trust is built and value is perceived” (85). I aspire to lead a professional life where all three are in balance. I aspire to be a part of a profession where all three are in balance—where there is a shared why and trust among the members and our value as leaders is widely perceived in the education field and beyond. I want to be part of a profession that “walks its talk.” And I will do my part to stay the course. I am indebted to Sinek for a way I used his framework to organize Building a Culture of Collaboration: School Librarian Leadership and Advocacy. I begin every chapter in my forthcoming book with “why” that topic is essential in building a culture of collaboration. In each chapter, I specify the “what” and “how.” Although the “whats” and “hows” were always there, I strengthened the “whys” after reading Sinek’s book. What is your “why?” How does it align with that of your site- and district-level administrators’ “whys”? How does it align with those of your classroom teacher colleagues, families, and community? Does your shared “why” make effective “whats” and “hows” possible? While authoring my forthcoming book, Maximizing School Librarian Leadership: Building Connections for Learning and Advocacy, I have read many professional books. This is the seventh in a series of professional book reviews–possible titles for your summer reading. The reviews are in no particular order. On June 12, 2017, I attended an ASCD Webinar presented by authors Eric C. Sheninger and Thomas C. Murray. (If you missed it, I highly recommend the webinar archive.) Their presentation was centered on their hot-off-the-presses book Learning Transformed: 8 Keys to Designing Tomorrow’s Schools, Today. After the webinar, I preordered a copy of their book and read it as I was completing my own manuscript. This book focuses on creating a culture of innovation and leading change. In reviewing their table of contents, I found so many parallels between their book and mine that I was, at first, reluctant to read it… until after I had submitted my manuscript. However, my curiosity won out. And I am glad it did. Reading their work at the 11th hour in my process gave me an opportunity to further develop my thinking, reflect, and include some quotes from their book in mine. 1. Leadership and school culture lay the foundation. 2. The learning experience must be redesigned and made personal. 3. Decisions must be grounded in evidence and driven by Return on Instruction. 4. Learning spaces must become learner-centered. 5. Professional learning must be relevant, engaging, ongoing, and made personal. 6. Technology must be leveraged and used as an accelerant for student learning. 7. Community collaboration and engagement must be woven into the fabric of a school’s culture. 8. Schools that transform learning are built to last as financial, political, and pedagogical sustainability ensure long-term success (24-27). I could not agree more about the importance of leadership and culture in creating the context for educational transformation. I believe future-ready librarians are positioned to be leaders and culture-builders in their schools. For those of us in the school library profession, “inquiry” is the process that we promote for redesigning learner-centered/personalized learning. Sheninger and Murray offer thoughtful strategies for leaders to make student agency a reality in their schools. Among them are standards-aligned learning activities and assessments, student mastery of selecting the right tool for the task, portfolios as authentic assessments, student involvement in rule making, and participation in feedback loops—choice and voice (76-77). Decision-making based on evidence also resonates with school librarians who develop library programs using evidence-based practice. One term that Sheninger and Murray use with which I was previously unfamiliar was Return on Instruction (ROI). They used this term in relationship to the funds and time spent on the latest technology tools and devices and ROI, evidence of improved student learning outcomes. I found the parallel between ROI and Return on Investment an important one. School librarians who serve as technology stewards evaluate and field-test digital resources and tools based on sound pedagogical practices and learning goals can be leaders in their schools in ensuring a positive ROI. School librarians also provide formal professional development and job-embedded personalized learning for colleagues through coplanning and coteaching. School librarians who have developed a learning commons model in their school libraries may be particularly interested in the chapter entitled “Designing Learner-Centered Spaces.” I suspect they will echo the authors’ contention that flexible spaces that “provide areas for movement, and promote collaboration and inquiry” (25) are needed if students are to explore creativity and reach for innovation. As a reader, I found the format friendly, quotes thoughtful, and examples from the field compelling. I suspect many readers will compare their teaching and learning environments to those described in the book. It would be important to find as many similar assets with these sites and explore how your own school could further expand its areas of strength. 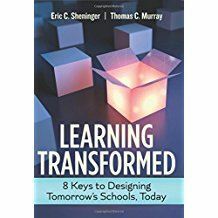 As an author, I was impressed by the endorsements Sheninger and Murray received for this book. Sir Ken Robinson, Linda Darling-Hammond, Daniel H. Pink, Robert Marzano, Michael Fullan, and many more education thought leaders have high praise for Learning Transformed. If you are in a formal or informal leadership position in your school or district (e.g. future-ready librarians and school library supervisors), then you will want to read this book and discuss it with the decision-makers in your school and district. Sheninger, Eric C., and Thomas C. Murray. Learning Transformed: 8 Keys to Designing Tomorrow’s Schools, Today. Alexandria, VA: Association for Supervision and Curriculum Development, 2017. While authoring my forthcoming book, I have read many professional books. This is the sixth in a series of professional book reviews–possible titles for your summer reading. The reviews are in no particular order. 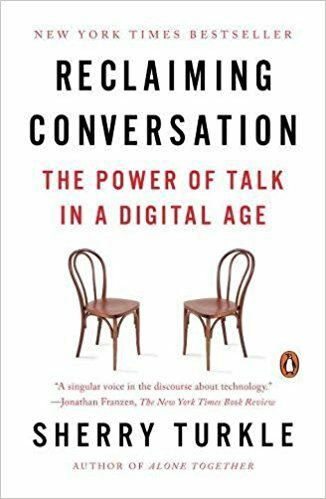 I published Part 1 of Sherry Turkle’s book Reclaiming Conversation: The Power of Talk in the Digital Age last week. In relationship to children, Turkle writes this: “If children don’t learn how to listen, to stand up for themselves and negotiate with others in classrooms or at family dinner, when will they learn the give-and take that is necessary for good relationships or, for that matter, for the debate of citizens in a democracy?” (14). “In these new silences at meals and at playtime, caretakers are not modeling the skills of relationship, which are the same as the skills for conversation. These are above all empathic skills: You attend to the feelings of others; you signal that you will try to understand them” (27). I have been in meetings where people are using their phones and may or may not be listening to the conversation. Or they may be using their laptops and checking their email—sometimes under the guise of making meeting notes. It may or may not be intentional rudeness but most meeting facilitators and people who speak for items on the agenda feel disrespected by not having their colleagues’ full attention. Turkle makes a strong case for conversation as the primary way we build empathy for others. As a book person, I believe that reading about other people’s lives has been a large part of my empathy building. Still, in face-to-face conversations with relatives and friends looking into their eyes, reading their faces and body language, that’s when I really understand what they are feeling. The same can be said for students in our classes and the colleagues with whom we work. Response: I have felt that disrespect. For me, it leads to a lack of trust in the person who cannot be “in” the conversation. I also believe this is one of the challenges in teaching 100% online. Students want to feel their instructors understand them, especially when they are having a problem. However, many would rather text or email than talk on the phone. Emotions are simply not communicated as clearly and misunderstandings can and do result. Turkle says that in face-to-face conversations it is often when “we hesitate, or stutter, or fall silent, that we reveal ourselves most to each other” (23). Slowing down the conversation in this way makes some people feel anxious, or bored. Some feel so uncomfortable they will turn to their phones and check out of the conversation. Response: Since reading this book, I have become more sensitized to my own feelings during the “silences” and “pauses” in conversations and during transitions from one activity to another. I have found myself reaching for my phone while waiting at the doctor’s office or standing in line at the market. I am catching myself more often and making a conscious decision about whether or not I want/need to consult my phone. Several times when I have opted out of connecting via tech, I have had an epiphany about an idea that’s be stuck in my head. I have even had pleasant conversations with the strangers sitting next to me or standing in line behind me. Turkle writes: “Until a machine replaces the man (who scans your groceries), surely he summons in us the recognition and respect you how a person. Sharing a few words at the checkout may make this man feel that in his job, this job that could be done by a machine, he is still seen as a human being” (346). Response: Turkle has given me another reason not to use the self-checkout machines. I have avoided them because they represent the loss of jobs. I will continue to avoid them and make an effort to engage in even a brief conversation with the person doing this work. Turkle claims her argument is not anti-technology. Rather it is pro-conversation. She invites us on a journey “to better understand what conversation accomplishes and how technology can get in its way” (25). She charges us to become different kinds of consumers of technology and compares this to the ways many people have become more discerning and knowledgeable consumers of food. 3. That we never have to be alone” (26). 1. Who do we want to “hear” us? And why? 2. What amount of control can we give up in order to put our attention on things not of our choosing that need our attention? Can we do that even when it’s “inconvenient”? 3. What could we gain by spending time alone with our thoughts—in daydreaming or self-reflection? As Turkle says people are resilient. We can change. We can pay more attention, listen more carefully, and respond to one another with empathy. We can do that by reclaiming the value of talking with one another face to face. We can do that by consciously deciding when to pay attention to people and when to pay attention to our machines. And we can model and practice this with youth, colleagues, friends, and family. Turkle ends the book this way: “This is our nick of time and our line to tow; to acknowledge the unintended consequences of technology to which we are vulnerable, to respect the resilience that has always been ours. We have time to make the corrections. And to remember who we are—creatures of history, of deep psychology, of complex relationships, of conversations artless, risky, and face-to-face” (362). Is summertime a time to start reclaiming conversation? It is for me. I hope it is for you, too. Turkle, Sherry. Reclaiming Conversation: The Power of Talk in the Digital Age. New York: Penguin, 2015. Turkle, Sherry. Life on the Screen: Identity in the Age of the Internet. New York: Simon & Schuster, 1997. While authoring my forthcoming book, I have read many professional books. This is the sixth in a series of professional book reviews–possible titles for your summer reading. The reviews are in no particular order. Sherry Turkle’s most recent book is definitely thought-provoking and timely for me. I recently returned from the American Library Association Conference in Chicago where I met with colleagues from across the country and a reunion in Kalamazoo, Michigan with long-time friends. During that week, I enjoyed face-to-face conversations and late into the night confessions with people I usually communicate with via email and social media. I experienced the deep sense of connection and empathy Sherry Turkle’s research suggests may be missing for many of us who spend most of our time using technology to mediate our “conversations” with others. To be transparent, I am a long-time reader (and follower) of Turkle’s work. I have read two of her previous titles (cited below) and have watched her TED Talks (“Alone Together” and “Connected, but Alone?”) I highly recommend everything she has written but Reclaiming Conversation: The Power of Talk in the Digital Age offered me the most powerful prompts for reflection related to how technology has affected my life and the lives of my family, friends, and colleagues. Turkle, an MIT professor, studies the psychology of people’s relationships with technology. As with her previous titles, this book is filled with research, anecdotes, and testimonials (and confessions) from individuals and focus groups who have shared with her their experiences with technology. There is no way to adequately summarize this work. Instead, I am sharing a few quotes from the book followed by my responses and connections to my own relationship with technology. I am doing this is two parts–this week and next. Disclosure: I own a smartphone. I do not use it to its full capacity in terms of apps and the like, but I do listen to audiobooks and music on my phone, send and receive calls and text messages, follow and post to my social media accounts, and use my phone to search for information and directions while traveling. I use my laptop more than my phone. I am a writer. I taught graduate students exclusively online for seven years; my laptop made that possible. My laptop (not my phone) is my life. 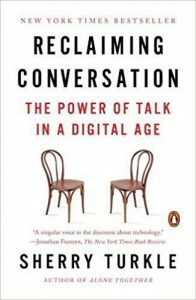 In this book, Sherry Turkle makes a compelling case for conversation. She writes: “We are being silenced by our technologies—in a way, ‘cured of talking.’ These silences—often in the presence of our children—have led to a crisis of empathy that has diminished us at home, at work, and in public life. I’ve said that the remedy, most simply, is a talking cure” (9). Turkle says “recent research shows that people are uncomfortable if left alone with their thoughts” (10). Many “always connected” youth call this space “boredom” and avoid it at all costs. They also find that face-to-face conversations contain “uncomfortable” moments of silence or long pauses when someone is thinking. Some say they must fight the urge to glance down at their phones while waiting for another person to think and speak. Turkle shares a new strategy some young people have developed to combat that urge. Some groups of young adults play “phone tower” when they go out to dinner. All the phones—left on—are stacked in the middle of the table. The first person whose phone rings AND they reach for it and respond has to pick up the dinner tab. It seems they could simply turn off their phones—but I guess not if they are “addicted” to them and would feel desperate if disconnected. A new norm Turkle described is the “rule of three.” When a group of four or more people are having a conversation, at least three of them have to be verbally interacting and making eye contact. When those criteria are met, the others are free to look at and use their phones to text, find and present new images or information—always being mindful of their commitment to be one of the three when needed. Response: I do not have that kind of attachment to my phone or the need to feel always connected. These and others of Turkle’s anecdotes were new to me. I believe they are true, but I had some trouble relating them to my own life. Turkle points out how often she notices parents and babysitters interacting with their phones rather than with the children in their care. Many young children have stopped expecting to have their parents’ full attention. Some parents who ban their children’s phones at the dinner table are still texting or taking calls because they “have to” conduct business 24/7. Turkle notes that even the mere presence of a phone on the table sets up the expectation that the conversation will be interrupted—an excuse to keep it light rather than of more consequence. She calls this “the flight from conversation” and compares it to climate change. Most of us know it’s true but too many of us don’t think of it as a pressing problem. As a parent, spouse, educator, and storyteller, I believe this is true: “Eye contact is the most powerful path to human connection” (36). I can believe this loss of connection could result in a decline in empathy. With the large and looming challenges we need to confront in our country and in our interconnected global community, a lack of empathy for “others” is, to me, a very troubling loss. Next week, I will post the second part of this reflective review.